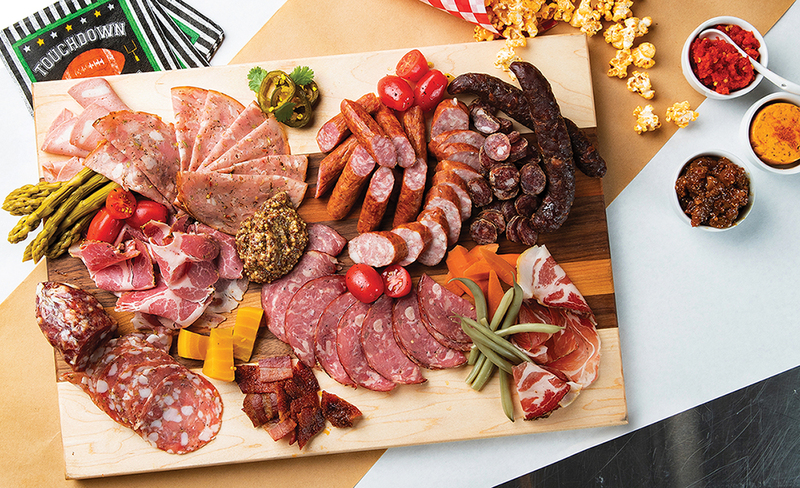 A great charcuterie board is easy to whip up, and thanks to spots like Meuwly’s, you can find a variety of locally made cured meats and condiments to showcase. Meuwly’s works with suppliers like Irvings Farm Fresh and Bear And The Flower Farm to get delicious, locally raised pork for its products. When it comes to picking the meats for your board, Meuwly’s co-owner and general manager Peter Keith has a basic formula. Go for one type of meat that can be cut into pieces such as smokies or pepperoni sticks, one dried, cured meat like coppa or prosciutto, and one or two types of salami. Add one or two cheese options, some extras like pickled vegetables, and a couple of condiments to finish it off. It depends on whether you’re planning to serve the board as an appetizer or as the main meal. If it’s going to be your full meal, Keith suggests aiming for 150 to 200 grams of meats and cheese per person, and another 20 to 30 grams of condiments. Meuwly’s sells the chorizo butter with which it tosses its chorizo-spiced popcorn; the versatile ingredient can be used in many home dishes, from spicing up your steamed vegetables to adding a kick to your crostini.